Main Auction Services, Inc. is a family owned and operated company bringing more than 35 years of combined experience in the restaurant, food service and related industries to the internet sales marketplace. Main Auction Services offers a wide variety of quality, new and used restaurant equipment, supplies and furniture. Main Auction Services buys and sells restaurant equipment in Texas and nationwide, with new inventory arriving on a daily basis. This inventory is made available to you through scheduled online auctions. Whether you need to buy or sell one piece, or the contents of an entire restaurant, Main Auction Services is your resource for late-model restaurant, bakery and bar equipment. Located on Main Street in Grand Prairie, TX, Main Auction Services is centrally located within the Dallas / Ft. Worth metroplex. Plans are in the works to open another location in the Houston area late in 2012. There are also plans to add home furniture, decor and appliances to the company's offerings in the near future. Main Auction Services is a member of the National Auctioneers Association, the Texas Auctioneers Association, and the Restaurant News Association. No matter where you are in the United States, or what you need, our team will customize the right plan for your new website. Call us today at 972-712-2100. Welcome to the iComEx Family Main Auction Services. We look forward to the future and doing business with your company. Congratulations on your Success! Heggy’s Nut Shop offers the freshest, premium roasted nuts and fine chocolate candy nationwide. For over 60 years our customers have enjoyed these delicious, high-quality confections at extremely competitive prices. The first thing you will notice is the taste. If the only nuts you've eaten came from a can or a jar, you are in for a treat. Heggy's will taste like something entirely different. The difference, we roast fresh daily and we add no preservatives. We are confident once you try our product you’ll want to enjoy them yourself and serve them to others. We ship freshly roasted nuts across the United States year-round. We select only fancy grade premium nuts from top growing regions and constantly scout the world supply for the best product available. We roast in 100% pure peanut oil for the perfect flavor and seal your product for freshness during shipment. 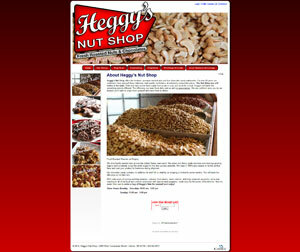 Heggy's Nut Shop is an ecommerce enabled website site, with over 350 combinations of nuts, candies and specialty products to choose from for your your enjoyment. No matter where you are in the United States, or what you need, our team will customize the best web site for you. Call us today at 972-712-2100. Welcome to the iComEx Family Heggy's Nut Shop. We look forward to the future and doing business with your company. Congratulations on your Success! 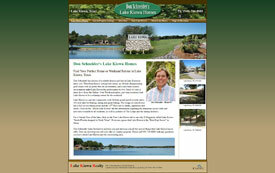 Don Schenider's Lake Kiowa Homes has dozens of available homes and lots at Lake Kiowa to show you. Waterfront homes with private docks, an 18-hole championship golf course with no green fees for all residents, and a laid-back country environment make Lake Kiowa the perfect place to live. Since it's only a short drive from the Dallas / Fort Worth metroplex, part-time residents find Lake Kiowa to be a relaxing retreat for the weekend. Lake Kiowa is a private community with 24-hour guard-gated security and a 563 acre lake for boating, skiing and great fishing. The Lodge at Lake Kiowa has a full service dining room and the 19th Hole serves drinks, appetizers and lunch. Click on the "About Lake Kiowa" tab for information regarding the numerous social clubs and activities available to all residents, as well as pictures of The Lodge and the dining facilities. For a Virtual Tour of the lake, click on the Tour Lake Kiowa tab to see why D Magazine called Lake Kiowa "South Florida dropped in North Texas". Everyone agrees that Lake Kiowa is the "Best Kept Secret" in Texas. Don Schneider looks forward to meeting you and showing you all the special things that Lake Kiowa has to offer. Don can also help you sell your lake or country property. Please call 940-736-8889 with any questions you have about Lake Kiowa and the surrounding area. We welcome Don with this new website and look forward to many years doing business together. Congratulations! Clay Janitorial is the best choice in the Dallas metroplex for commercial cleaning and building maintenance for companies that care about providing a safe, healthy and clean professional working environments. Managed by a team of industry experts with over 25 years of janitorial service experience, Clay Janitorial in Dallas, assigns a work team to plan, conduct, and follow up on the work we do for you. Clay Janitorial realizes that the sanitation of your workspace is crucial to how your company performs, and we pride ourselves on a reputation for providing superior janitorial services to owners and managers throughout the North Texas region in Dallas County and Collin counties. Clay Janitorial Service in Dallas provides professional cleaning services to a wide array of industries including medical facilities, property management companies, retail stores, banks, schools, mid-rise and high-rise buildings, car dealerships, industrial plants and more. Clay Janitorial is a locally owned company, and is proud to be trusted by business professionals in the Dallas / Fort Worth area. 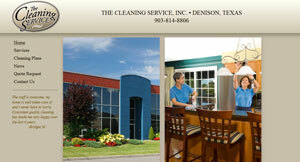 Insured and Bonded, we offer professional cleaning services which will maintain the appearance of your facility. No matter where you are in the Dallas metroplex, or what you need, our team will customize the right cleaning plan for you. Call us today at 972-463-6604! Welcome to the iComEx Family Clay Janitorial. We look forward to the future and doing business with your company. Congratulations on your Success!